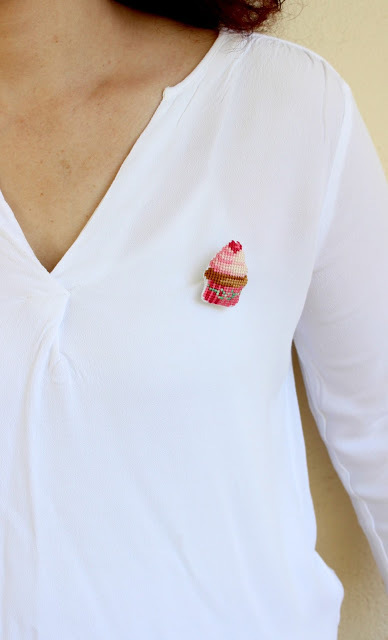 Piece of cake… piece of cupcake! You go to Me and Mama Creations shop and you choose what to eat and you just order it. 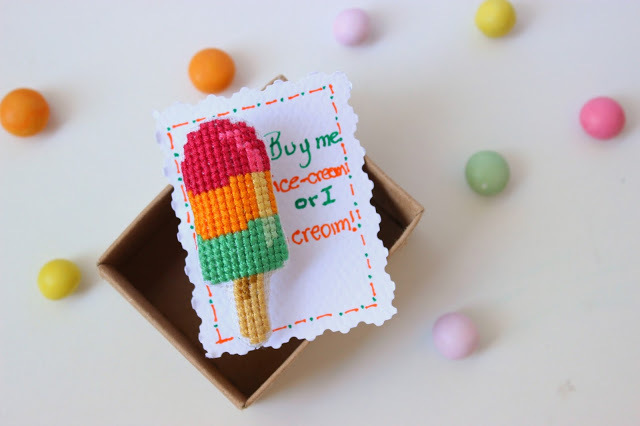 Magically a tiny sweet will be in your hands! Ok… not a real one, but at least so sweet and cute like the real one and without calories! What I got? 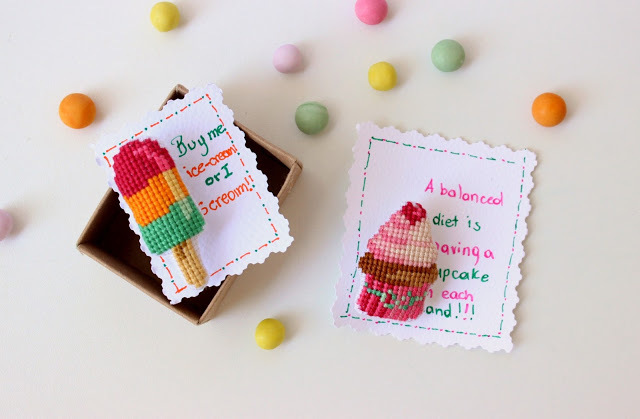 A tiny cupcake with strawberry and cream and my favorite fruity ice cream…it is Summer, don’t forget! 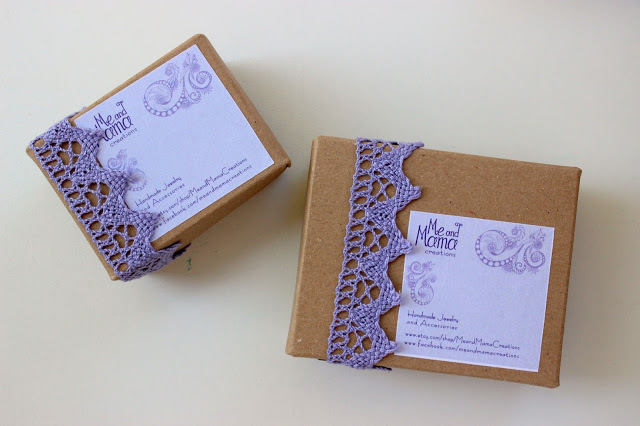 A couple of days later I had my two new brooches in an beautiful box with a lilac lace ribbon and to be honest I adored how the jewels were decorated inside the box. So unique. 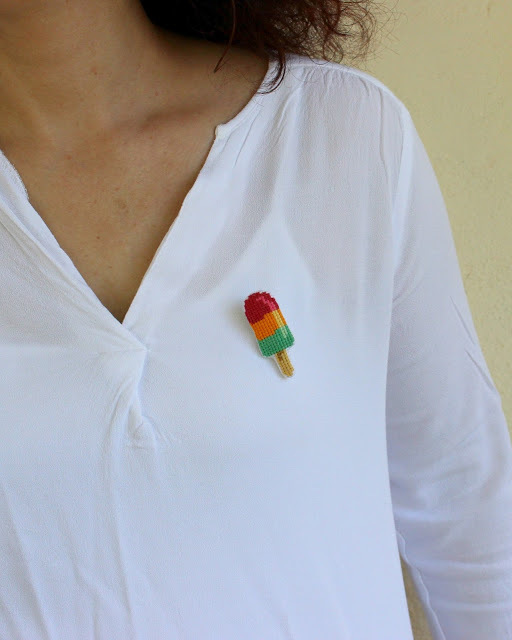 White shirt, pastel colors on my style and my brooches are ready to be “live”. I wear them one by one or both, but from yesterday I enjoy them also on my summer blue bag. They are really cute sweets to have with you. So well crafted, with gorgeous colors and small enough to enjoy them all the time. Are you jealous? 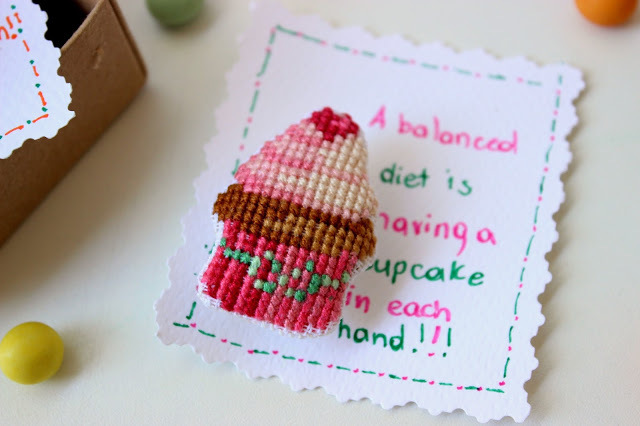 You can have yours… just visit Me and Mama Creations on etsy or in facebook to choose your favorite cross stitch food jewelry. Really, what are you going to eat? Είναι πανέμορφα όλα όσα φτιάχνει Η Λία!AriadnefromGreece! Πάρα πολύ γλυκές και του κουτί τους πολύ κοριτσίστικο με την δαντελίτσα!! η δαντέλα όντως όλα τα λεφτά!!! Τι τέλειες !!!! Μπράβο !!!! υπεροχα!!!! το παγωτακι το ειδα στην τσαντα σου και το λατρεψα. μα τι ομορφα! χαιρομαι που σου αρεσαν τα γλυκακια…και χωρις θερμιδες! Και παιχνιδιάρικα και δεν παχαίνουν! Τέλειος συνδυασμός! Μεγεια σου Ζήνα μου! χαχαχαχα ακριβως! Σε ευχαριστω Κατερινάκι! Άκρως χαριτωμένα!!! Άμα έχει μεράκι ο άνθρωπος…. Απίθανα τα άτιμα!!! Μπράβο βρε κούκλα!